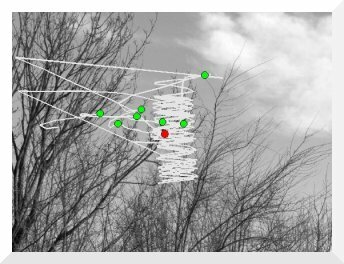 DOVES (a Database Of Visual Eye movementS) is a collection of eye movements from 29 human observers as they viewed 101 natural calibrated images. Recorded using a high-precision dual-Purkinje eye tracker, the database consists of around 30,000 fixation points, and is believed to be the first large-scale database of eye movements to be made available to the vision research community. The database, along with MATLAB functions for its use, may be download freely here, and may be used without restriction for educational and research purposes, providing that our paper/this website are cited in any published work. van der Linde, I., Rajashekar, U., Bovik, A.C., Cormack, L.K. (2009). 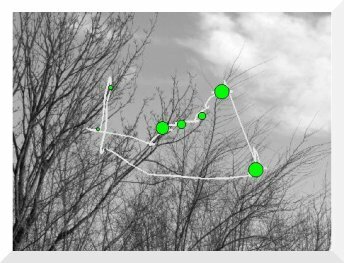 DOVES: A database of visual eye movements. Spatial Vision, 22(2): 161-177. 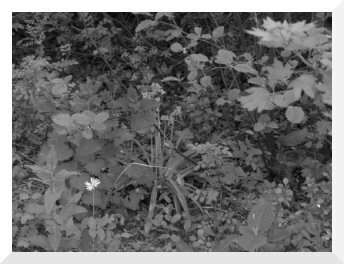 The still images used in this experiment were selected from the Natural Stimuli Collection created by Hans van Hateren. The images used are modified from the original natural image stimuli, by cropping and using only the central 1024x768 pixels. Permission to release the modified images on this site was graciously granted by van Hateren. In addition to the above citation, we ask that you acknowledge van Hateren's image database in your publications, following the instructions provided in http://hlab.phys.rug.nl/archive.html. The zipped files have been password protected. Please email Ian van der Linde (ianvdl@bcs.org) for the password. Kindly indicate your university/industry affiliation and a brief description of how you plan to use the database. Download entire database here. If you download this database, it is assumed that you agree to this copyright agreement. Images: This folder contains the 101 natural image stimuli used in our experiments. Fixations: This folder contains the eye movement data for each image, stored as a separate .mat file. Both raw eye movements and computed fixations are stored in each .mat file. Run view_doves_fix.m to see an example of how to use this data. RawData: This folder contains, in plain text format, all the information that was collected in the course of the experiment. Each file corresponds to an observer. Besides the raw eye movement data, you can obtain information for the memory task, results of eye movement calibration, and other details of the experiment, including mining for eye movement statistics. Since the information is stored in plain text format, it will be compatible with any user-written software and does not require the use of MATLAB. If you prefer to use your own algorithm to compute fixations, you may use the raw eye movement data from the Fixations folder or from this folder. Code: This folder contains a selection of MATLAB programs that will help you access the data in DOVES. view_doves_fix.m: This program illustrates how to read in an image, the corresponding eye movement data from the Fixations folder. The eye movement data for each subject is then superimposed on the image. view_doves_raweye.m: This program illustrates how to read in the raw eye movement data stored in the RawData follder. This information is also accessible from the data in the Fixations folder. view_doves_rawcalib.m: This program illustrates extraction of just the eye movement calibration data from the RawData folder. view_task_results.m: A program that reads in the results of the yes-no memory task, and counts the number of hits, misses, correct rejections, and false alarms. You can use view_doves_fix.m to load an image and show the eye movement scan pattern and the computed fixations for each subject. Fixations of first subject. Red square shows first fixation. 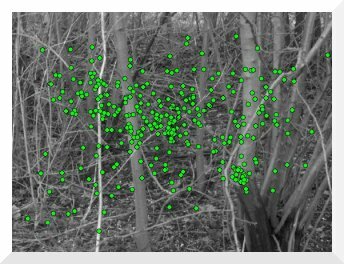 Green dots show computed fixations. White line shows the "raw" eye movement trace. Fixations of second subject. Note how both subjects fixate on the flower as expected. Example of the eye tracker "losing track": If you plan to use your own code to generate fixations from the eye movement data, please be aware that, the tracker may have occasionally lost track of the observer's eyes. This can be seen in the eye movement trace as a repeated vertical sinusoidal path. Your fixation algorithm should be able to ignore this, since its spatio-temporal dynamics do not resemble those of a human fixation. As can be seen in the following figure, our fixation algorithm does not compute fixations in the sinusoidal data, but captures fixations otherwise. An example of the eye tracker calibration. The red dots show the location of calibration locations. 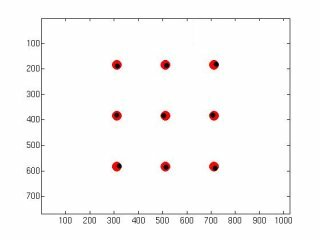 Black dots are the subject's recorded eye positions when looking at the red dots. van der Linde, I., Rajashekar, U., Bovik, A.C., Cormack, L.K. (2009). DOVES: A database of visual eye movements. Spatial Vision, 22(2): 161-177. URL: http://live.ece.utexas.edu/research/doves.